According to an email from Bauerle, the program is housed on the fourth floor of Unit 1 Slottman and currently consists of nine students. According to the website of UC Berkeley’s Division of Equity & Inclusion, one percent of undergraduate students identify as Native American/Alaska Native. Campus freshman and current NATP resident Louwana Montelongo, who grew up on a Cherokee reservation in North Carolina, talked about the program’s small size. “All the theme programs have a floor. 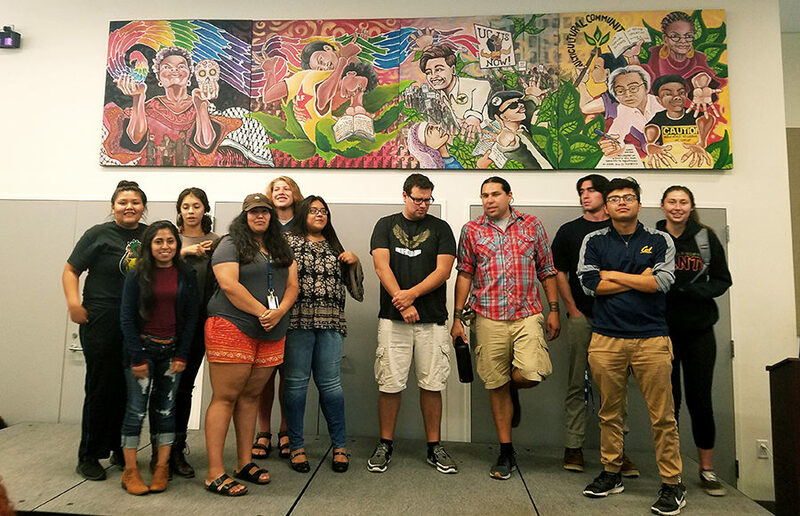 We unfortunately didn’t have enough Natives to fill up the whole floor, so … the last four rooms are (where) the Native students (live),” Montelongo said. As far as theme programs go, UC Berkeley offers several. According to the campus’s housing website, interested students fill out a housing application that gives them the option to write a short essay if they want to participate in a theme program. Examples include Unity House in Unit 3 Spens-Black, the Asian Pacific American theme program in Unit 2 Cunningham and, of course, NATP. Like all theme program participants, those who live in NATP must participate in a weekly graded seminar, as well as several community events. According to the NATP website, students do not necessarily have to identify as Native, Native American or indigenous to be accepted into the theme program. The main prerequisites are wanting to learn about and advocate for Native American issues. For Rebeca Mendoza, a campus junior transfer and current NATP resident who identifies as Mazatec, the former is her reality. “I didn’t know about (Native history) in California or other states where there are a lot of native people. Being part of this program … I learned a lot,” Mendoza said. NATP especially seeks to educate participants on local Native history. Bauerle said that for Indigenous Peoples’ Day, the NATP residents will be making an excursion to Alcatraz Island for the Sunrise Gathering to commemorate the 1969 occupation of the island by Native American people. This is a mandatory field trip each year, as it is a significant event that doesn’t get enough exposure. More than anything, NATP seeks to make its participants aware of what a Native American identity means. According to Bauerle, NATP is a “safe space” for residents to explore and recognize their backgrounds and histories. For students like Mendoza, who is a recipient of the Deferred Action for Childhood Arrivals, or DACA, program, NATP has also been a valuable resource for her in light of DACA’s repeal. Beyond building a strong and valuable community within the walls of Unit 1 Slottman, NATP participants are also advocating for Native American issues pertaining to UC Berkeley as a whole. “We felt that this is something we could easily be targeted for … for us to speak out is kind of nerve-wracking, just because we’re such a small group here on campus,” Montelongo said. UC Berkeley has also been viewed critically for not repatriating the human remains of an estimated 12,000 Native American people. According to Bauerle, this is one of the largest collections of indigenous remains in the nation, second only to the Smithsonian Institution. There are also other collections, such as wax recordings of indigenous languages that campus researchers have worked to digitize. “That’s a really positive thing. … (But) with a lot of the collections, they hold on to them: Tribes don’t know what’s here,” Bauerle said. This leads us to a broader question: What can UC Berkeley students do to support Native American people and spaces?